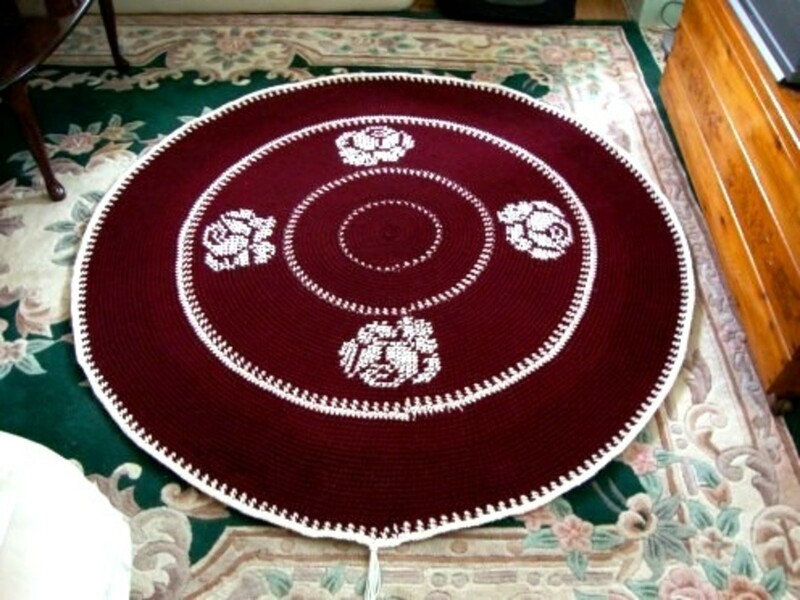 Have you ever wanted to crochet a round rug? There is just something so charming about this type of area rug. 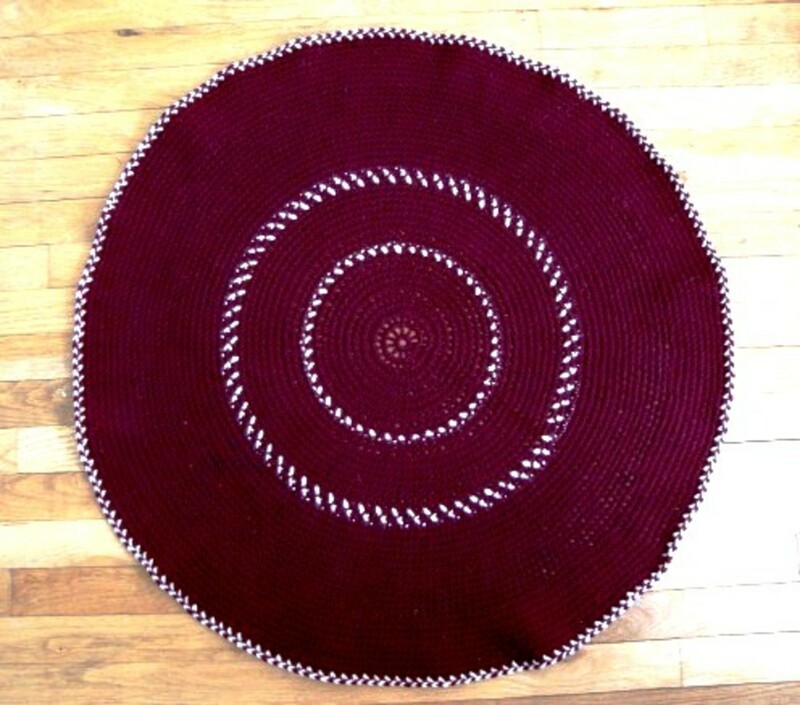 While there are other ways to make circular rugs, I've always thought a crocheted rug is the easiest method because you don't have to sew in any strips. I like that by dent of crocheting, each row is joined to the previous row. I'd always wanted to make a round rug and finally rolled up my sleeves and took the plunge. I did not work from a pattern and just went "free-style." Any crocheter will know that circles can be tricky and with a project of this size, even trickier. I knew to get this rug to spread out flat might be a challenge, so before I even began, I developed the mindset that if I wanted a round crocheted rug, I had better be prepared that making it flatten out might be difficult. I basically designed this rug as I went and was very pleased at the finished results. And I will tell you up-front that I did some ripping back. Sometimes we have to work something and stand back and look at it, before we decide it's either yay or nay. I worked this rug "free-style." I knew I wanted a round rug and I knew I wanted to add roses but this was totally done without a pattern. You can do this too! Your imagination can be your guide and the results may be outstanding. The primary one being that single crochet gives you a nice compact, dense stitch that would wear well over time. Many crochet stitches are large and lacy-looking but would not do for rug making. You can fly right along with single crochet. I wanted to use a stitch that would serve as a background for adding flowers. For this you need a stitch that resembles squares, so you can work your flower stitches over top. I wanted the rows to look similar to their braided counterparts and single crochet fit the bill nicely to create this effect. Skeins of 7 oz worsted medium weight acrylic yarn. Number of skeins will vary, depending on the number of strands used and the size of the finished rug. I chose a nice raspberry color for this rug but, of course, any color could be used. #5 or 6 crochet hook. I used two yarn strands of medium-weight yarn for this rug. For a thicker rug, I would suggest using 3-4 strands. A heavier rug is ideal because it retains its shape and slippage is less likely. Alternatively, one could use rug yarn or a bulky weight yarn and simply use two strands. Red Heart has a chunky yarn in Claret, for those wanting the maroon color. Many have asked me what yarn I actually used to make this rug. This rug can be worked in a single color or created in panels of alternating colors. You can, of course make your rug as small or as large as you want. Row 1: Make a beginning loop, work 10 SC in the loop, close with a SS, pull yarn end to tighten loop. CH 1. Continue with each row using SC throughout. Incorporate Increases every 5-10 rows, as needed by crocheting 2 SC, 1 SC, and repeating for entire row. After the first 5 rows, do not CH 1 at the end of row, rather SC into this stitch and work rug in a continuous circle to eliminate a seam showing. As can be seen in the photos, doing this eliminated the seam, but there is a slight off-set. This could be camouflaged by a leaf or a small rose. Keep working rows until your rug is the desired size. End with 1 SS in last stitch. Work two more SS and tie off. I wanted a variegated look to my rug so I introduced cream-colored yarn but I did not cut my maroon yarn. I worked my rows switching between colors and carrying the secondary color along the back of the work, by hooking around it. This works well for a row or two but if you plan on adding more rows of alternating colors, you will need either a yarn tainer or a homemade yarn holder because when alternating your colors, you will find your yarn twists. Tangling is a real problem. Having to stop and continually unwind tangled yarn is a waste of crafting time. Work another 10 rows, then work 1-2 rows of alternating colors. Work another 20 rows, then 1 row of alternating colors and one final row worked in bone. 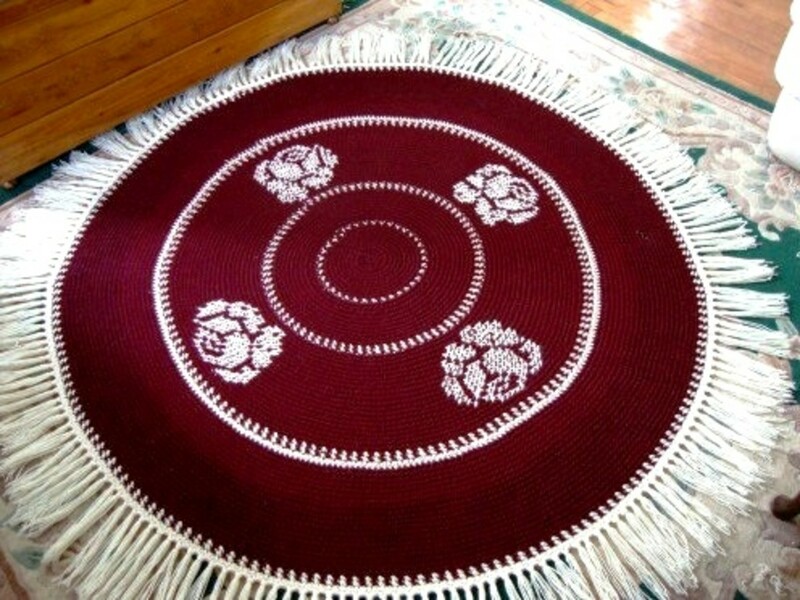 As a round rug becomes larger, the stitches may be pulled apart and the rug may begin to curl around the edge. This problem is corrected by working extra stitches into the pattern as increases. 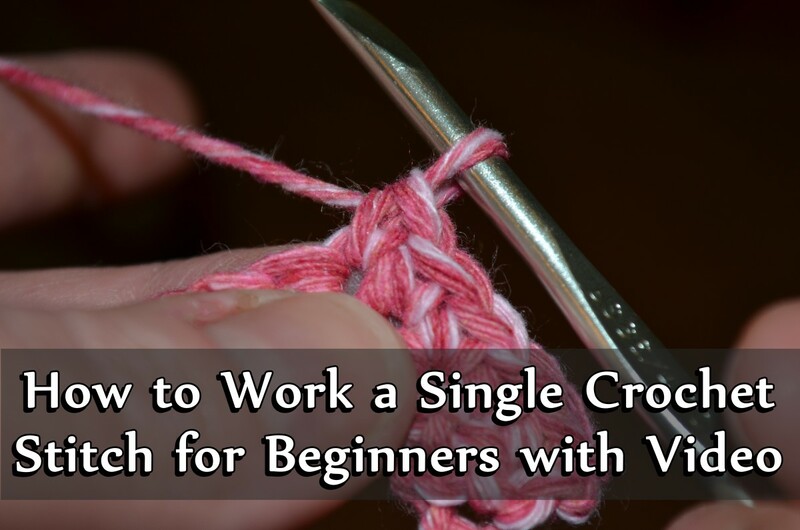 If necessary, pull back a row or two and add extra single crochet stitches. 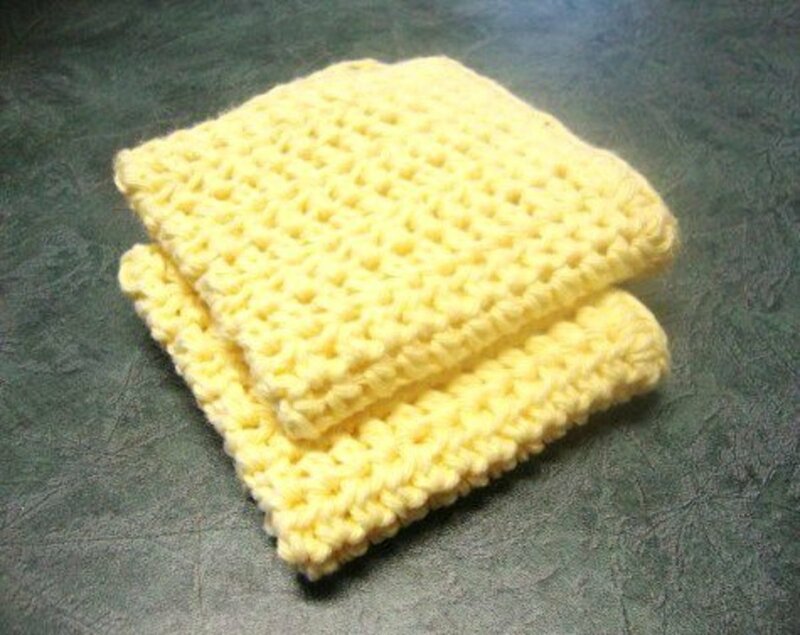 Increases are added by crocheting two stitches in one stitch. It is important to make sure that increases are added evenly so that the rug retains its round shape and does not develop planes. When an increase row is next executed, 5-10 rows later, the increases should fall between the two previous increases. Doing so ensures the rug does not develop planes and does not take on a hexagonal or octagonal shape. I executed this method for this rug but you can also use the more common increase method, as outlined in the videos below. As I touched on, whatever method you use to add increases, make sure you do so in such a fashion that your rug does not develop planes. Another problem encountered when trying to crochet a round rug is bunching. After increasing, a rug might bunch and refuse to flatten. This problem is addressed by adding successive rows of regular stitches and not including increase rows until the rug completely flattens. Still Unsure About Increase Rows? 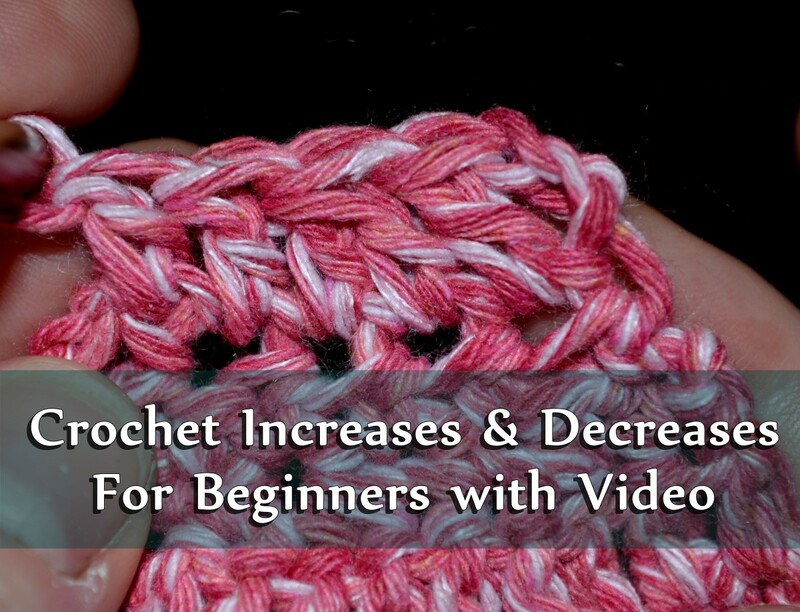 I've included the three videos below to help you in relation to increases and how to work them in single crochet in successive rows for your rug. As can be seen, there are different ways to do this. When making a rug using multiple strands, tangling becomes a significant problem. Believe me, after working with two strands to make this rug, I came away with a whole different attitude towards tangling. My best recommendation to avoid this is to invest in yarn tainers or make your own yarn holders. Find something to put your yarn in to keep each ball separate. Doing so will save you so much time and frustration! When your rug reaches the desired size, the next step is to add your roses. If you've created panels in your work, as I did with this rug, this makes things easier when it comes time to add flowers to your rug. You will have a visual divider to work from and fewer stitches to count above and below your roses because the lines will create a natural demarcation. Take a length of wool and place it across your rug; take another length and place it across in the opposite direction, so that you have a +. This allows you to create 4 quadrants and you can use these to estimate the size desired for your roses. If you've created a plain or paneled rug, after counting and deciding where you want your roses to go, you'll next want to mark the spots with yarn or stitch markers. It can be tricky adding a cross-stitch to an increase row and the best way to do this is to go for the visual if the numbers don't work. 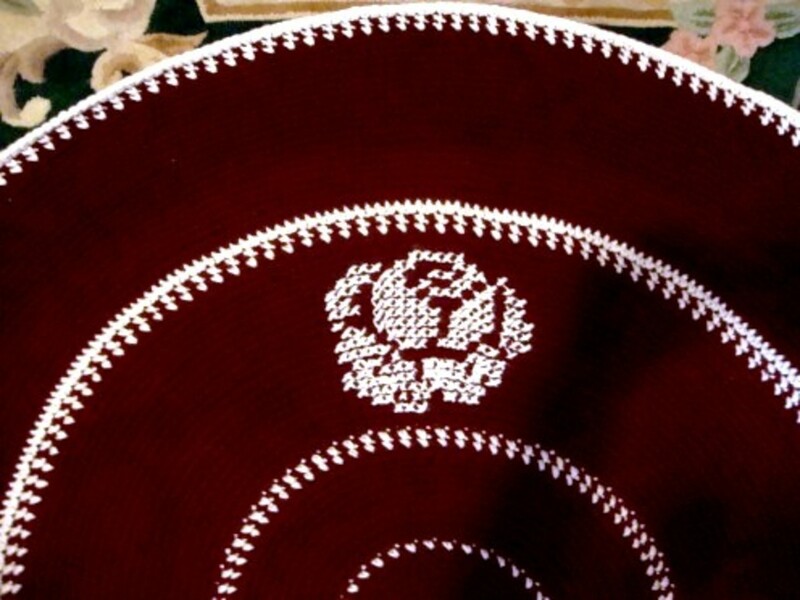 This wouldn't happen if you were adding roses to a square or rectangular rug because there would be no increase rows--you would have straight rows of single crochet stitches forming neat squares. I looked in my crochet book for a filet crochet pattern for roses, then used cross-stitches to add them to my rug. These were added after I had finished the rug, so the roses were not worked in as I was crocheting my rows but cross-stitched on top of my single crochet stitches. As I mentioned above, a length of yarn can be used to create 4 quadrants or you can use a broom handle and lay it across in a + shape, to create 4 sections. Doing this helped when estimating the number of stitches (squares) to leave between the roses. The hardest part of this was deciding on the spaces I desired between the roses. I worked the first rose, then counted the number of cross-stitches at the widest point of the rose to determine where to place the remaining three roses. If you decide to do this, count and double check to ensure everything turns out as hoped for. For each open square on the graph, I counted 1 SC in my rug (but did not cross-stitch over it). For each solid square in the graph, I worked 1 cross-stitch. Panels--Panels can be made by using a different color for some rows. Colors--Advanced crocheters may choose to alternate colors by carrying the secondary yarn color behind the stitches (inside stitches as you work), as I did here to create the variegated rows. While this can be done for a row or two, doing this results in the yarn twisting, so if you want more than two rows, place your balls into some type of yarn holder to prevent strands from twisting. Designs--Flowers, hearts or diamonds may be cross-stitched over the squares formed by the single crochet stitches. 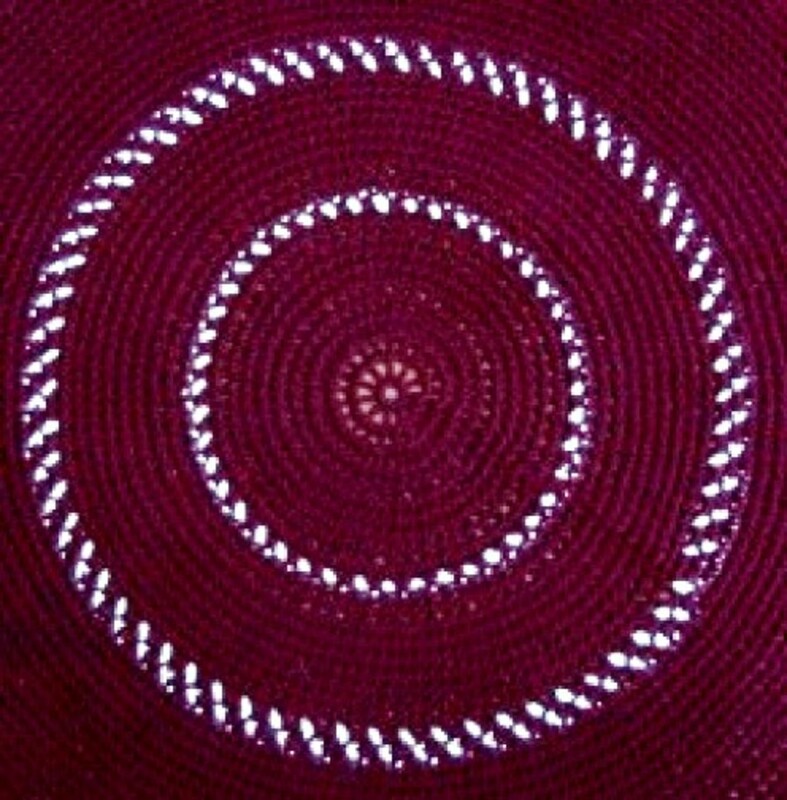 Because a crocheted round rug contains increases on some rows, cross-stitches may have to be adjusted. Filet crochet designs are the perfect fit because your single crochet forms "squares" and you can use the squares that appear in a filet crochet graph pattern for a guide as to where to place your cross-stitches and where to leave any (single crochet) open squares. Tassels--Tassels or a fringe may be added to rug edges. Wind yarn around a book and then cut to desired length. This helps you to cut uniform strands. Padding--If you are worried about wear, you could choose to put padding under your rug. Thicker Rug--If you want a thicker rug, simply use 3-4 yarn stands. Rug Yarn--Alternatively, you may choose to use heavier rug-making yarn. I'm ever thankful that my grandmother encouraged me to learn to crochet when I was 12. Perhaps many of you will agree with me that the things we learn to do when we are young stay with us through the years and truly benefit us. 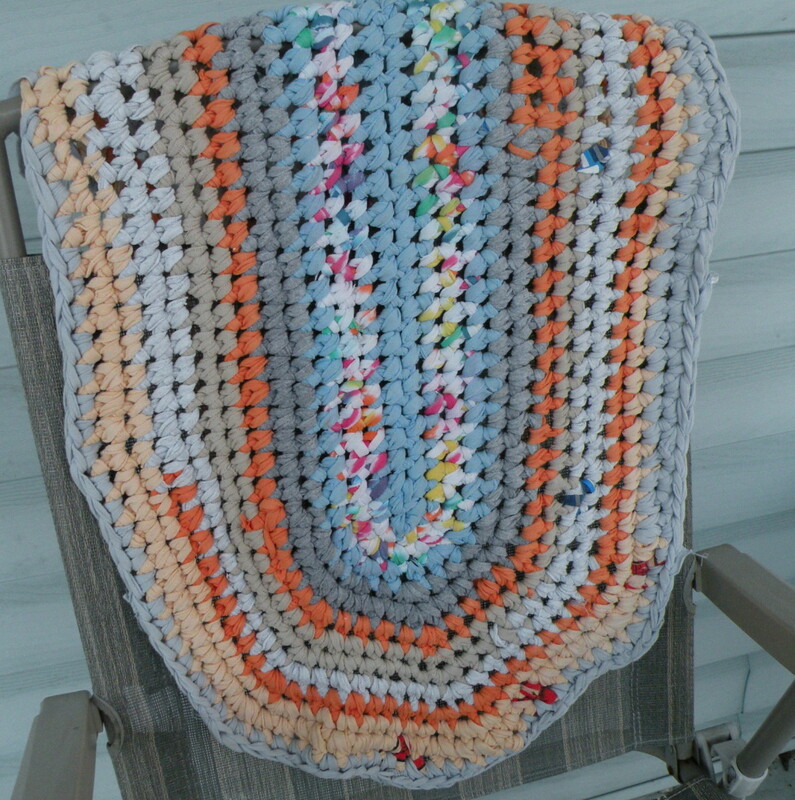 Have You Ever Made a Crocheted Rug? I had to opt to either join each row, which would result in a seam. or work in a spiral to eliminate the seam. I chose the latter which gets rid of the seam but results in an offsetting. One could hide this where it appears by adding leaves. While I made this rug with two strands of yarn, if I were to do another, I would probably use 3 strands for a thicker rug or use a chunky yarn and two strands. Making a thicker rug also reduces slippage. How Would You Rate This Crocheted Rug? I had long wanted to make a round rug and am happy to share the results with readers. Making a crocheted rug and opting for a circle, rather than a square or rectangle, may have been a little trickier but the results made it well worth the effort. Thanks everyone for all your great comments. Much appreciated. Really nice job! Thanks for taking us through your project. Thank you, Koffee Klath, I have to admit, I was very pleased with how this turned out. And using a filet crochet graph, then cross-stitching over the single crochets, worked out even better than I had hoped. What a beautiful rug. We will be moving in the new year and I would love to use a rug like this in the guest room. 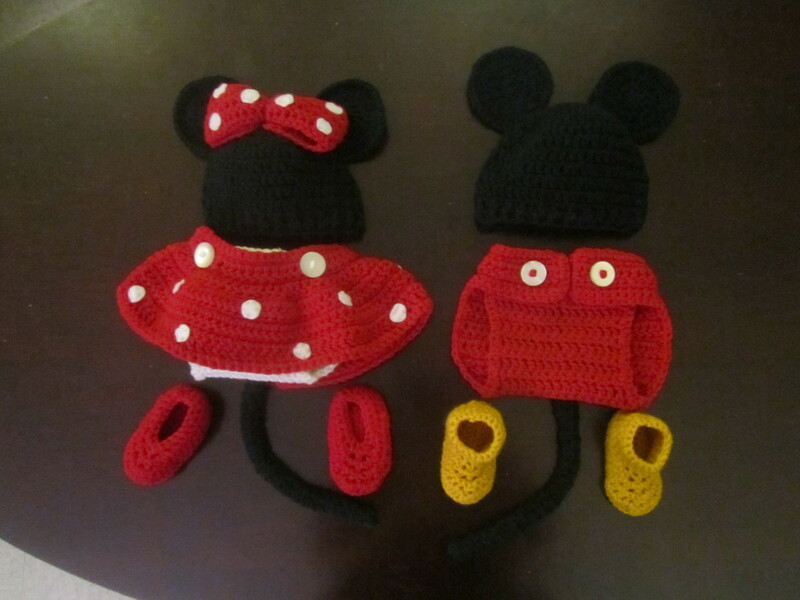 Wow, I can not wait to start making it. You guys are great. Thanks so much for taking the time to comment. What a spectacular piece of work, Athlyn! I love the colour and the style. I love the fact that you found a beautiful place to use it so you can admire it everyday! I learn to crochet when I was younger and I hope that one day I can go back to it :-) It's important to have dreams.... and I have a few of them! Hi everyone, I've started my rectangular rug! 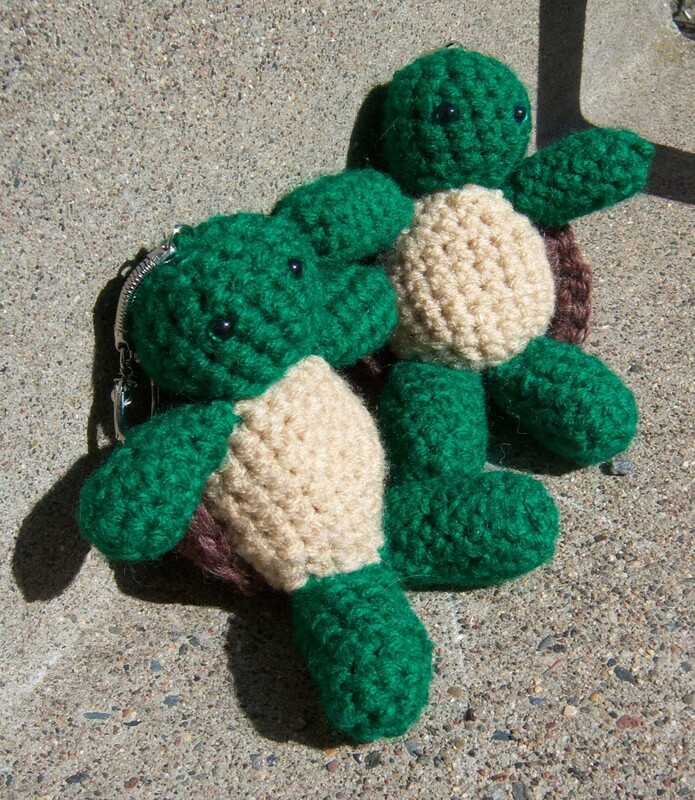 I've also started a crochet blog, http://athlynscrochet.blogspot.ca/ and will be sharing over there, as well. Thanks so much for your kind comments. Nice to know other like this crocheted rug. When I started out, I really had no idea how it would turn out. I pretty much created as I went along. Wow and wow again. Never have l seen such a beautiful piece of crochet. 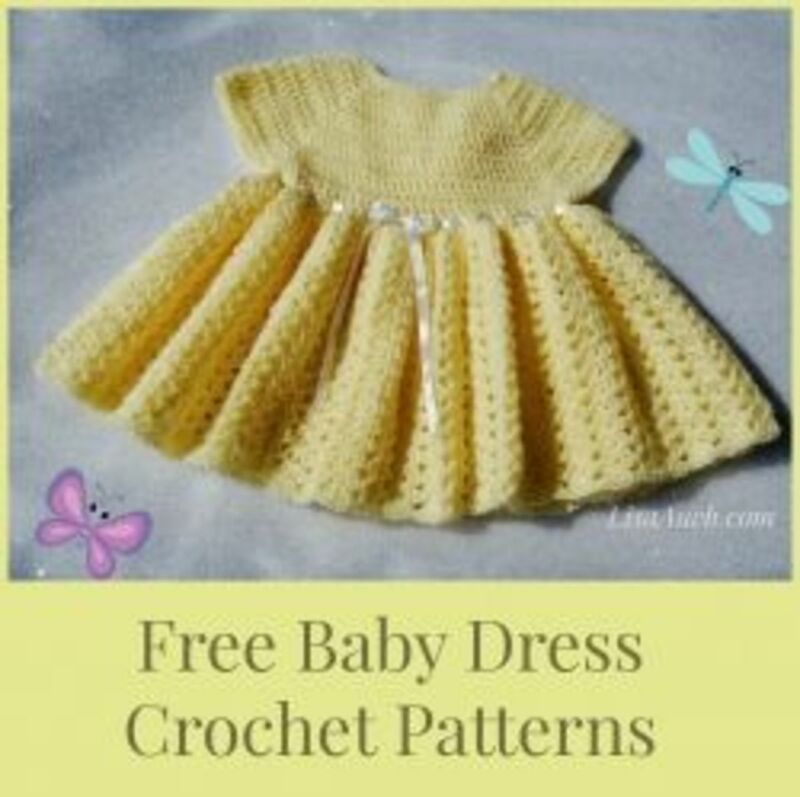 Before arthritis stopped me knitting and crocheting l used to make some fabulous things.............. but not like this. I am so impressed with your patience and your kindness. In sharing the method of working it. Three cheers for you l say. These don't take too long using single crochet. hoping that one day, I can make one. 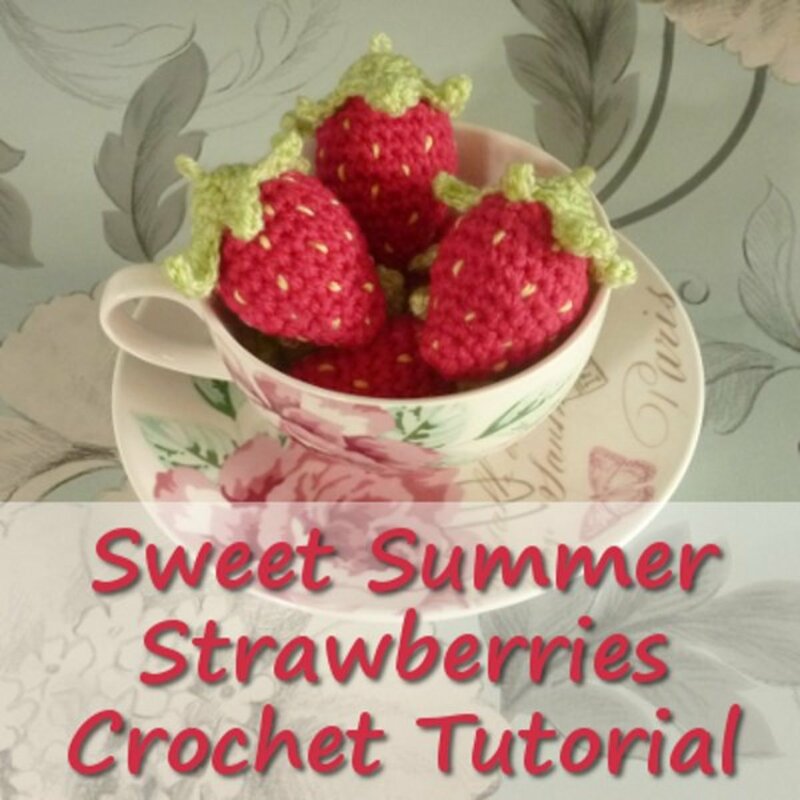 Thanks for sharing with your crochet group and I hope this hub is helpful. I shared this with my crochet group. I hope it brings you lots of traffic. This is an especially nice pattern. Thank you.The single crochet goes fairly quickly; adding the roses took a bit longer. I'm not a cross-stitch fan but for this, it was perfect. Wow, this is beautiful! Very practical too. It must take a lot of patience to do this. Thanks for sharing. Voted up and useful, and congrats on the HOTD award. Wow! All these great comments! Thank you! I love it and I want one! 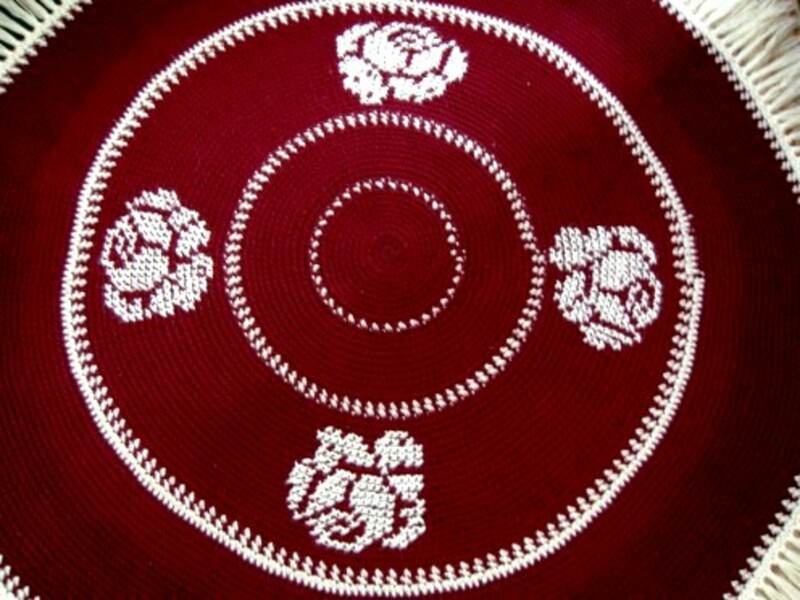 A very detailed and easy to follow crochet pattern for your round rug. You are very talented. Congratulations on your Hub of the Day! 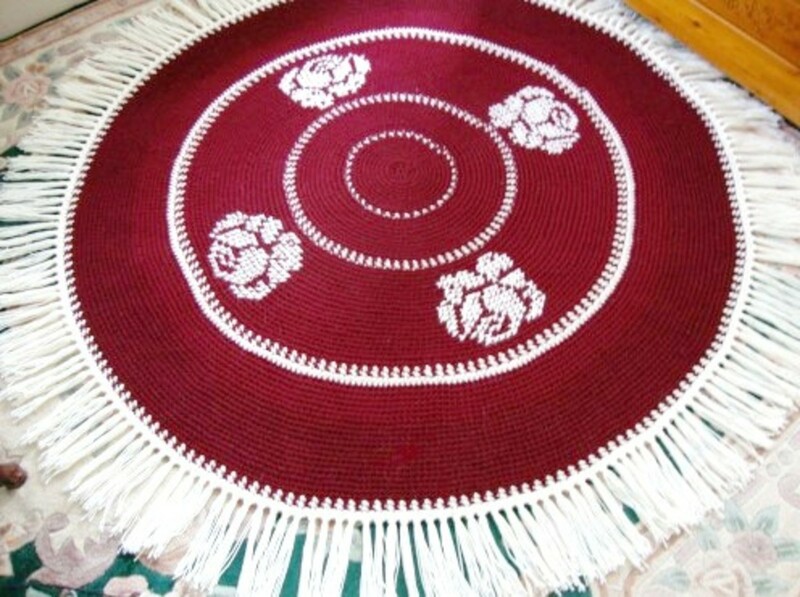 I love to crochet, and this round rug is so attractive. I like the idea of using only single crochet as this should make the project go a lot faster. The addition of fringe around the edge does dress up the rug beautifully. Voted up and shared! Thanks for your great feedback and your insights about the sidebars, something to consider for future hubs. I'm so glad I tackled this project and am very pleased with the results. Congratulations on your Hub of the Day. It is well deserved. I loved your use of side bars to highlight certain tips and bring attention to lines from your directions. I think I know what I am going to do with the skeins of yarn I never used because I got too busy. This will be a nice addition to my kid's room when we transition to the "big girl and boy" room with a specific theme. Yes, it helps to think outside the box with crochet. Once basic stitches have been mastered, it can be very gratifying, adding extras to your work, such as flowers as I have done here, or crystals and beads. Adding these additional elements makes any piece truly special. This is so pretty.. thanks for sharing:-) congrats for HOTD. What does everyone do to crochet in the round to make all stretch out flat? I had to experiment with this but managed to get it perfectly flat. All this positive feedback is great and much appreciated. This is very well presented hub. Looks really beautiful and attractive. Crocheting is my favorite and I have done a lot of work in this. This rug I am definitely going to try. Thanks for the instructions! This is just beautiful! Beautifully made! Rated beautiful.. wish I had time to actuslly make one. Thank you for the tips on how this is done. Beautiful rug and so well advised on crocheting too, I so much would like to take this on but sometimes think it is for the older people. I may have more pics of when this was in progress and if I find them, I'll post them. Thanks ! What a gorgeous piece! Thanks for the detailed instructions and detailed photos. Thanks for the great feedback! I was very pleased with the end result. I want to make another rug using four strands this time, maybe a rug in dark green with roses around the edge. 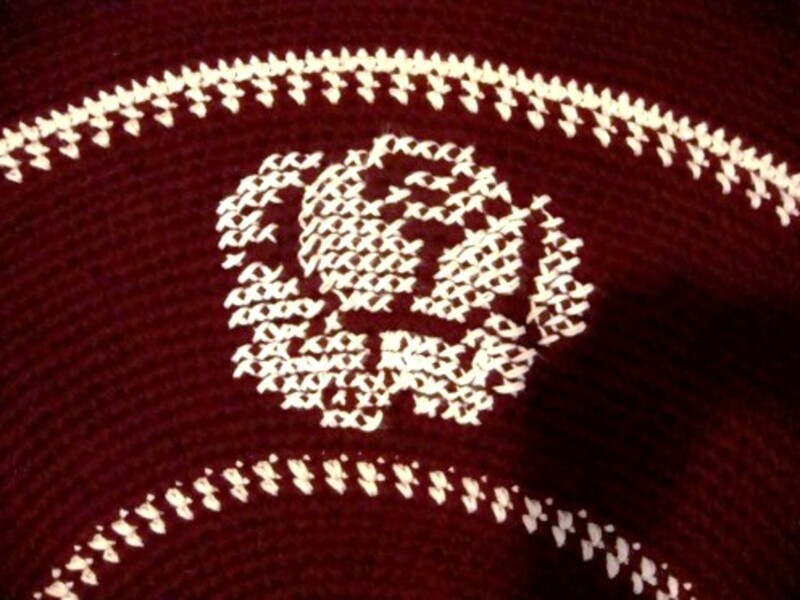 With a rectangle, with a fixed number of stitches on each row, there would be no increase stitches, which would make applying the roses much easier. That is beautiful! Will definitely be sharing with my crochet friends! I love the rich, Victorian look that it has. You needed a lot of patience...I guess. What an incredible rug, it looks so professionally made. I am currently making a crocheted rug out of a pairs of old jeans and it is growing quite nicely. 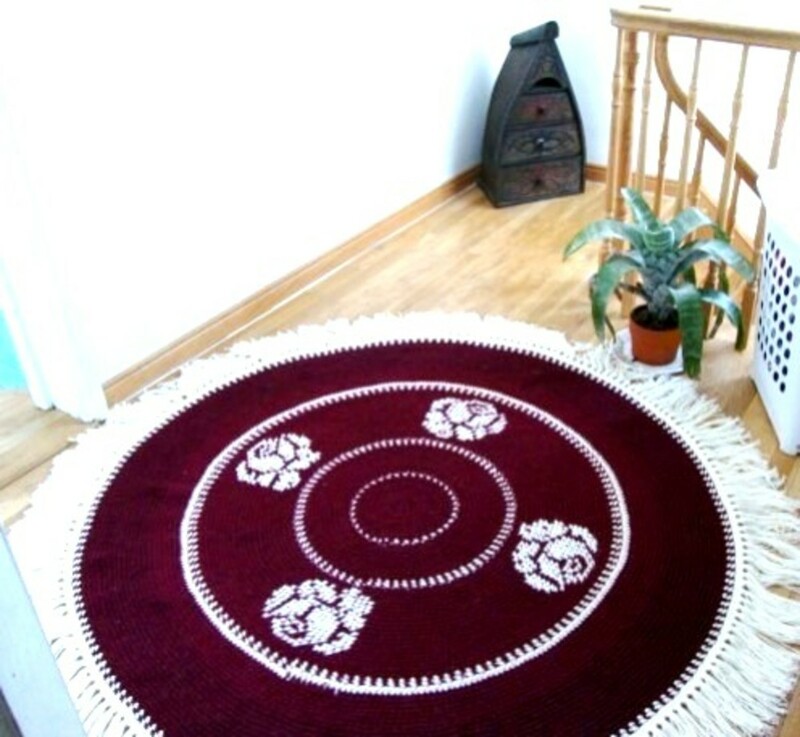 I am really impressed with the rose rug motifs, because it is something quite special. I had just got into fillet, and want to make some large blinds using a heart pattern ( need a some more hours in the day day though)- amazing hub- well done. Wow, that is truly spectacular! I love to crochet, the tips on creating the roses are really appreciated. Very nice craft and hub to share, thank you.